Friends, I have a story to tell you. Ok, maybe its not a story so much as a bunch of things that tie into one really awesome thing. This is a huge deal. I think. This could revolutionize the way we do family history and the way we memorialize our departed loved ones AND ourselves. Are you ready? So at some point not long after Lucy passed away, we were sitting in the cemetery and I said something like this to Vic. "I wish there was a way that when people came to the cemetery and saw Lucy's headstone, they could also learn about her life. How did she die? Who is she related to? I wish there was some digital something or rather where a visitor could let us know they stopped by and paid their respects. And a way that people could see photos and videos of Lucy. Plus, I'd love to know who all of Lucy's "neighbors" in the cemetery are. Do you think we could invent something? How would it work?" The wheels started spinning and I wanted to figure out a way to make it work! An mp3 player of some kind you could have in the headstone? I'm not a techy or a scientist or anything. I mentioned the idea to a few people, I heard tales of someone out there hoping to find investors and invent something along these lines, but nothing ever came to fruition (that I'd heard of). I did hear something about solar panels on headstones that could generate power and then...I don't know, something would happen after that. It sounded a bit complicated to me. BUT BUT BUT... I was contacted recently by a company in Minnesota and asked to partner with them on this AMAZING AMAZING AMAZING new product. QR CODES FOR HEADSTONES! That's not the name of the company. The company is Katzman Monument Co. But they offer two REALLY cool products. 1) You can digitally design a headstone from the comfort of your home. You can pick size, shape, color, text, font, etc. and as you design you can see the cost. You can share your ideas via email with friends and family and they can add their input, etc. This means you don't have to go into a monument shop, look through old binders of other deceased people, and try to pick out the perfect memorial for your loved one. You can do it on your time, in your pajamas, while crying, or whatever. They ship anywhere. I think its brilliant and needed. 2) And this is what I'm most excited about! 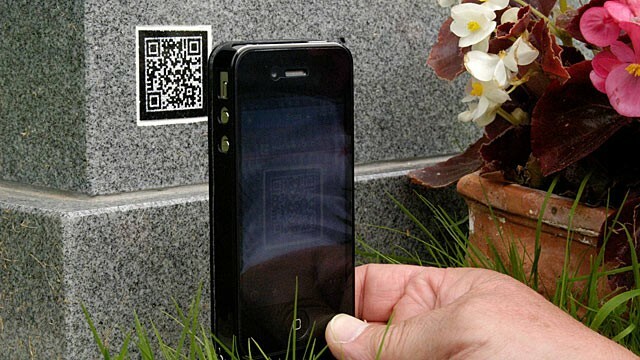 You can purchase (they call them "Interactive Monuments") a RUBBERIZED QR CODE to adhere to any existing headstone. When someone scans the QR code, it takes them to a website just for that person--complete with a family tree, photos, videos, a place to leave comments, etc. ISN'T THAT COOL??!!! Don't know what a QR code is? Confused about what I'm telling you? Watch THIS CLIP and it will make sense. So here's the deal-- you can start creating your own page through Katzman Monument via your personalized QR code BEFORE you die. This means people will get to hear about your life through your own words and not someone else's! You can link it to your blog, whatever. You guys, this is breakthrough! You can put these on any existing headstone as well. Have you ever been to the cemetery and seen a sheet of paper under a rock that says, "If you are related to this person will you please contact me? I'm trying to do family history work and need some help..." Well, I have seen that many times while visiting Lucy. If you already know where some of your ancestors are buried, buy them a QR code, upload a few scanned photos, and stick it to their headstone. People will see their family tree when they scan the code! I CANNOT TELL YOU HOW EXCITED I AM ABOUT THIS!!!!!!! If you go to the KATZMAN MONUMENT site, you can order one. Honestly, these would make a great Christmas gift. Sounds a bit creepy? Not really...we all die. We all will die. And we never know when it will be. So why not digitalize your life and have it connected to your headstone! Several of my friends are buying them for their spouses for Christmas. This company is WONDERFUL, they have great 24 hr. customer service, and they will ship the code right to your home (or wherever you want it sent). A QR code is coming for Lucy in the mail next week and I'm anxious to stick it to our headstone and start uploading content. Do you understand how cool this is??? I'm dying! And one more thing-- when you purchase one under my name (Molly Jackson) you will get a huge savings. These normally sell for $249 but if you tell them I sent you, you can get one for $175. *I am an independent contract employee for Katzman Monument Company. WOW... I must admit I was initially creeped out, but then, this is just absolutely awesome! Thanks so much for sharing the information!!! I am totally and completely fascinated by the very thought of this. So you can put this on a loved one's grave marker right? And then can you actually link them to a family blog or website? You just link them to one place, right?...not more than one link, right? As it shows you in the video, it links to one site that contains 4 tabs. One tab for photos, one for video, one for the family tree, and one for the obituary/comments/text. Within those tabs (the text tab with the obituary) you could link to a blog. Really amazing isn't it??!! I am in complete amazement right now! I know myself, that I have wondered around the cemetery where my sweet sister is and have found myself looking at old graves and wondered how that person died. I mean WOW this is really cool! I'll admit, when I just read in passing about QR codes for headstones, I thought, "Why in the world would I do that?" but this makes so much sense when you think of the way it could connect people with their genealogy and loved ones and connect others to them. Definitely made me do one of those "Oooooooh... I get it now." Whenever I go to the cemetery to visit my Uncle Lionel (who passed away after a horrible infection invaded his body. He was told he was cancer free a few weeks prior to his death), my Uncle Nelson (who was murdered in 1992. One of the men responsible was just released from prison) and my grandfather (who died of Alzheimer's when my mother was 18) I sometimes walk around and look at the names on the other headstones and wonder what their stories are and how they died. So, I think this is wonderful. I would want others to know more about my deceased relatives as well other than just a name on a headstone. You know, I really love this idea. Think of what this could do for family history research! This is really great. Whenever I've visited a cemetery to visit a deceased relative's grave, I like to walk around and look at other headstones and wish I knew the stories of the people who were buried there. So many stories! I love it! Thank you for sharing this sounds like something right up our ally. David is always saying for his headstone he wants some crazy electronic thing like a holographic screen or something that he can design and show his love for electronics. I always tease him about it but anything electronic like this I think he would think was very useful and interesting. Mol, I recently heard someone at church talking about this idea. It's so cool! I'm happy you get to be part of this cool announcement! Molly. This is amazing. It truly brought tears to my eyes. My sweet brother passed away a little over two years ago. He was 18 years old. The only brother in a family with 4 sisters and the main man in all of our lives. My mother has struggled with getting a headstone because she feels it is so final. One of her greatest fears is that people will forget my brother. This is truly amazing. I spoke to my husband tonight and we are going to order one for my parents for christmas so they can finally get my brothers headstone and know that he will not be forgotten. I just had my first child in June. We named him Hunter, after my brother. I think this idea is amazing and will allow my son and any other family member, friend or stranger to know and remember my brother. What an amazing idea! I am the daughter of a funeral director (think of the movie My Girl) so I've been surrounded with death and cemeteries for a good part of my life. It's amazing how far we've come even since I was a kid. This is a WONDERFUL idea. So innovative and useful. I have heard that there is a registry being set up where people go around with their smart phones and take photos of headstones to categorize and have available for people who are doing family history. My son may do this for his Eagle project. The QR code would take that to a whole different level! This is so very, very, very cool. So glad I know you :)! Sorry Molly, but I have another question....is there a registry somewhere of graves that have the QR codes already on them? I would love to go check out a few even if I have to drive several hours.